Xeros continues to spend big on R&D and commercialising its patented polymer technology as it develops "IP-rich, capital-light models" in cleaning, tanneries and textiles. Based on the Advanced Manufacturing Park (AMP), Xeros is a Leeds University spin-out that has developed a patented system using a unique method of special polymer beads rather than the usual large amounts of fresh water to clean clothes. It is also working to deploy the beads in large scale tanneries and develop the technology for the use in the production of textiles. In its results for the six months to June 30 2017, the AIM-listed firm discussed progress made in each target sector. In cleaning, the firm reported on its Symphony Project which is spearheading a move away from the company manufacturing its own machines. Instead, a simple retrofit pedestal can integrate the polymer bead cleaning system into conventional machinery, enabling its water-saving revolution in laundry to be brought to market by leading manufacturers. The company said that it is "making allies of former competitors." Xeros successfully demonstrated a working prototype at the Clean Show in early June and recently signed a development agreement with a leading manufacturer of commercial washing machines. Exemplifying the move away from the capital rich model of providing machines to laundries, Xeros has partnered with Hitachi Capital to provide a range of lease financing packages to customers. The total installed estate of commercial machines has increased by 36% to 378 machines with new markets opening up in countries with water scarcity issues such as Australia and Dubai. The focus for Xeros is raising revenue through the beads themselves. Service income from the installed machines has increased significantly during the six months, showing growth of 82.6%. Group revenue for the six months was £1.1m, up from the £0.8m in the same period last year. Revenue is not recognised from a machine sale until a number of stages are completed. A further 55 machines are currently going through the stages with 82 moving towards binding agreements. Mark Nichols, chief executive of Xeros, said: "We have continued to make sound progress on the implementation of our strategy to establish our unique polymer technology in three world-scale industries: cleaning, tanning and textiles. "We are developing IP-rich, capital-light business models to licence our technology to world-leading market incumbents that will provide Xeros with stable income streams with long term visibility. 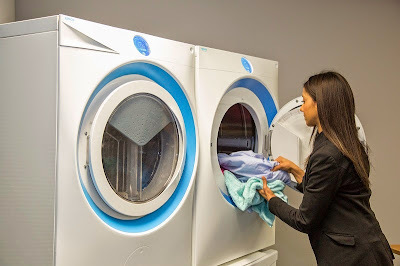 "In cleaning, we are beginning to make allies of former competitors through our Symphony Project and have developed what we believe to be a breakthrough in the design of domestic washing machines incorporating Xeros technology." All eyes will be on Xeros at the Consumer Electronics Show in Las Vegas in January where the company is expected to demonstrate the domestic machine design. Researchers have been working on a prototype which targets simple changes for the incorporation of Xeros' technology within any domestic washing machine. 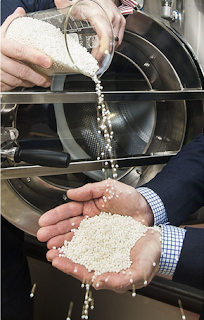 During the six months, Xeros spent £2.8m on R&D including staff and patent costs. Overall staff numbers have increased from 108 to 134. In line with the board's expectations, the group posted an adjusted EBITDA (earnings before taxes) loss of £13.2m, an increase on the £7.4m loss posted last year. Much of the spend has been on the development of the textiles applications and further polymer development activity. Xeros' intellectual property portfolio now has a further seven patent family applications, taking the total to 48. The third generation of polymer beads have given early indications that the technology can reduce the chemistry, water consumption and effluent in textile manufacturing. Further along in development is the use of the beads in leather processing. A 10-year contract was signed in July with Wollsdorf Leder in Austria to progressively convert re-tanning processes to Xeros' technology. Four European tanneries have completed R&D trials and three European tanneries are expected to start trials before the end of the year. Having raised a further £40m in a share issue at the end of 2015, the firm has some £16m in reserves to continue its commercialisation. The update concluded that the board believes that Xeros remains "well positioned to deliver further progress on commercialisation across all targeted applications in the current year and into 2018."